I was pleased to hear that William Roache, one of Britain’s most talented and enduring actors, was cleared of the charges against him this week. My publisher invited him to write a forward for my book, Gifts From Angels, back in 2011. In my correspondence with him, it was clear that he was a deeply spiritual person, a warm, kindhearted gentleman, and a consummate professional. In that one sentence he showed both compassion for those involved in the case – his accusers as well as himself and his supporters – and offered reconciliation and hope. It led me to reflect deeply on the need for forgiveness, reconciliation and release in all our lives. It is, sadly, in our human nature to be adversarial. We are competitive animals, evolved from the natural world of ‘fight or flight’ and so often, when things go wrong, we seek comfort for ourselves by putting blame on others. I’m not suggesting for one moment that those who do harm to others should not be held accountable or brought to justice. But in our day-to-day lives the temptation to blame others rather than take responsibility for our own actions is strong. It can destroy relationships and bring misery to all sides. As spiritual beings, we have the power to overcome this weakness. We can, with the help of whatever God we look to, and our guides and angels, learn to offer forgiveness to those we believe have harmed us, and in doing so, begin the process of reconciliation. Blessing those around us every day, even those we do not like very much, is a powerful way of doing this. 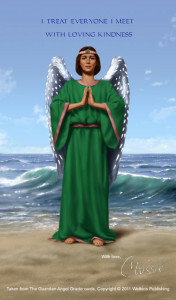 It doesn’t have to be open or out loud – just a quiet thought or moment of silence, calling on the angels to help you forgive and bring peace to any situation. By doing this, we keep control of ourselves, begin to release our anger and move forward from whatever hurt has been done to us. I have been getting enquiries about doing more one-to-one sessions and offering personal spiritual coaching. This is something I have always offered, but not really made a big ‘song and dance’ about. However, for some, an hour of guidance, reflection and sharing of spiritual energy can make a huge difference and I would like to offer my knowledge and gifts to you if you feel the need for that guidance. Deepen your insight leading to a more fulfilling Spiritual Life. Sessions may include self-help tools & exercises for you to continue to use after your consultation, and/or messages received through my beautiful Guardian Angel Oracle cards. I offer a limited number of one-on-one sessions each month which take place over Skype, although I can also arrange to meet if you are in the South East of England. Consultations can be booked individually, or as a series, offering the opportunity for more ongoing spiritual growth, mentoring and support. You can even work with me each month as you progress through the home study programme, Educating Heart & Soul. To highlight this service more widely, I’ve set up a free prize draw on my Facebook page. Simply visit the page before the end of February and enter your details and I will pick one individual for a free one-to-one consultation, which can be arranged at a time convenient to you. Or if you would like to book a session with me sooner, just visit the website or call the support team on +44 1223 969858.